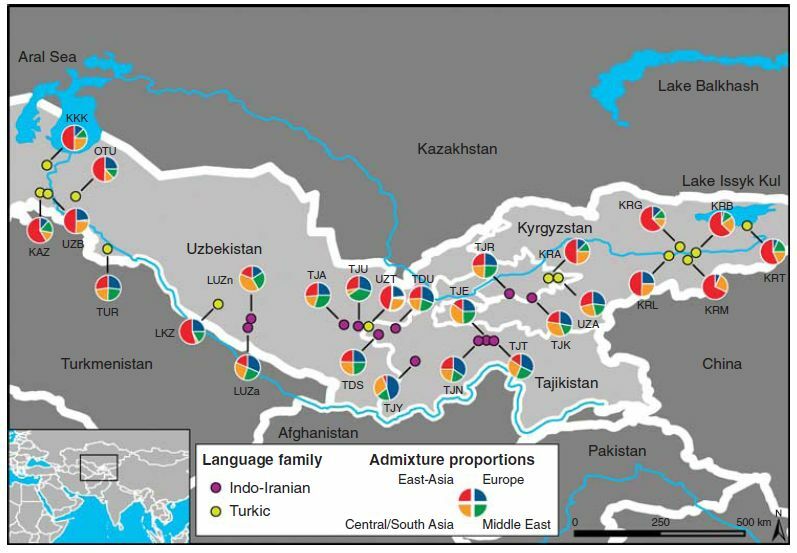 We propose that the complex genetic landscape of Central Asian populations results from the movements of eastern, Turkic-speaking groups during historical times, into a long-lasting group of settled populations, which may be represented nowadays by Tajiks and Turkmen. Turkmens are nomadic (at least they were so until being forcibly largely settled by the Soviets during the 20th century) and Turkic-speaking. Do they say that Turkmens may genetically represent the pre-Turkic settled populations of Central Asia? Another thing that has caught my eye here is that here they mention pre-Turkic settled populations but omit pre-Turkic nomads. Most of pre-Turkic Central Asia was already nomadic, represented by Sakas/Scythians, so Turkic expansion in Central Asia was mainly into an already nomadic area and culture. BTW, wish they had included more countries from Central Asia and the surrounding territories in their analysis. Dieneke, is the population abbreviated as TUR Turkmen? 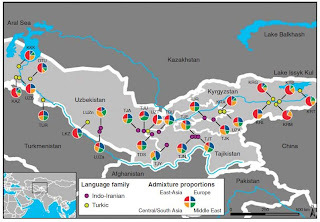 If yes, it seems Turkmens too are genetically Central Asian Iranian-like (thus I guess answering my question in my previous post, but still they should have also mentioned pre-Turkic nomads in addition to pre-Turkic settled populations). Also if they are Turkmen, are they the only Turkmen population tested? If they are the only Turkmen population tested, then this doesn't tell us much about Turkmens in general. Maybe pre-turkic populations settled in the region a long time ago but had a nomadic lifestyle (within the region). "If they are the only Turkmen population tested, Then this doesn't tell us much about turkmans in general." You mean they used the word "settled" to mean being long-lasting in the territory instead of living in immovable houses? I don't think that is the case as they use "settled" together with "long-lasting". Thanks a lot for this article and all the articles of the last month (especially the one about Carlssen&democracy...)I should say that the link below(that you provided)refering to the mythology of central Asian peoples (is it about ergenekon and the shewolf ashina...?) does not work. Ashraf, "din" entered Turkic languages from the Arabic version of the word and after the Islamization of Turkic-speaking peoples just as it entered any other language of the world with Islamization, so it doesn't prove your point. But you are probably right about "oekuez", "koemuer", "kedi", "kaz" and "tshelebi" (these words are probably ultimately from either an Indo-European, Semitic or any other West Asian-Mediterranean language). OTOH, "Tshelik" may be an originally Turkic word and may have entered Persian from a Turkic language (probably from an Oghuz Turkic language during the last millennium). I don't know the etymology of "kam", so I cannot say anything about it and would be appreciated if you inform me about it. You are probably wrong about "ketshi" as it is probably an originally Turkic word. As to "eker", I have never heard of such a word, so I can't say anyhing about it. I don't know how Ashraf arrives at his linguistic conclusions based on that map.. which clearly shows both blue and green in most of the regions. According to Gamkrelidze&Ivanonv "eker" and "ketshi" are indo-european/semitic common words. You know that agriculture and animal domestication was "discovered" in the fertile crescent area (and also metallurgy first appeared in Anatolia)and thus the words connected with agriculture, metal and husbandry diffused to central Asia either by demic or/and by cultural diffusion as wandeworts. The words "ek,ekmek,eker"=to sow are connected with proto Semitic "akar" (field) proto Indo-European "agr" (field) and also Sumerian "agar" (field)=>indirect loanwords ie wanderworts. I know that "din" is an Arabic "loanword" I spoke about old Persian "dena" (religion) which is not explainable by iranic etymology but has Semitic etymology and connected derivative words such as "dayna, daynu, dayn" from ps "dyn"=rule, justice. As for Turkish "tshelik" (the other words for metals in Turkish are also "loanwords" like "kalay", "kurshun", "bakir","guemuesh" and that's normal cause metallurgy "urheimat" is Anatolia and not eastern Siberia...) I think that here too we should look for an Anatolian origined "wanderwort" and an etymology from a language of that area (ie Anatolia, Caucasus and Western Asia as a whole) for the obvious reasons I explained (ie eastern Siberia recieved metallurgy from Anatolia) and the Turkic etymology does not look convincing (ie from "tshel"=to hit)+the Turkish words that start with "tsh" many times end up being "loanwords" as if proto Turkic forms could not start with "tsh". That blue (if it's the same dark blue showed in Behar's study)is too old (its genesis is very old) to fit with bronze age proto indo-europeans who have a language that contained words for both agriculture&metallurgy while the dark blue appears as a very old component that had its genesis by paleolithic times and thus it should be a primitive basic language consisting of some hundred of monosyllabic onomatopeic sounds and that's why this language was completly submerged by the advancing anatolian farmers (light blue component=>languages such as khattic, pelasgian, vasco-aquitano-iberian...) and then by the bronze age indo-european "warriors"
And according to some linguists (I forget his name but it could be Kalevi Wiik?) traces of this very old language could only be found in some substrate words amongst some isolated Saami groups. I haven't read Gamkrelidze or Ivanov, so I cannot make any comment on their etymologies. Thank you (I quoted some sections of Gamkrelidze&Ivanonv book in other forums) but the difficulity is that there is no proto Altaic nor even proto Turkic roots that could explain the etymology of "kurshun" and "guemuesh"+ the fact that "plomb" and "argent" metallurgy did not originated in eastern Siberia that's why one will think that a "foreign" source for those words is not impossible. I think it is going to be quite hard to get a solid grip on the chronology and sequencing of the migrations, and to tie linguistic evidence to genetic evidence, until we have better archeology from the region, which is astonishingly unexplored given its importance it putting together a lot of important puzzles (Indo-European origins, South Asian migration waves, Mesolithic Eurasian activity, etc. ), presumably mostly not because the evidence isn't out there, but because local political conditions were not conducive to doing the work once people figued out that there ought to be something worth finding out there. It seems as if there was a considerable period in which these civilizations were very developed for civilizations that left no writings behind. Current linguistics and current genetic makeups simply lack much power to tell you when they arrived on the scene in the period before we have good historical records. I have educated guesses, and I suspect that anyone who looks at the data is bound to develop those, but without some solid carbon dated traces of ancient material culture (or even better, ancient DNA) in some of these areas with little reported archeology, it is hard to know. A few preliminary academic writings a glanced now and then (sorry, citations lost), translated from Russian from the Caspian Sea area is suggestive of Egyptian influence and megalithic activity far further into Central Asia than one would ordinarily imagine from a pretty ancient date. If I were to pick one area where I would expect to be really surprised by new findings in a way that might change the overall picture, this would be it. There are what are called "sound shifts" for example Greek "bio" (life) Latin "vita" and Sanskrit "jiya" old irish "bethu" old english "cwic"[read quick] cognates that descend from the same constructed (but its more collect to call it guessed) proto indo-european root *gwey which means "to live"
Note that those cognates of the descendant ie languages do not all mean "life" but semantically have various meanings from "live" to "world"
The word "kam" was most likely inherited from a centum ie language and as you know Turkic words can not start with the sound "sh"=>all the words that start with "sh" in Turkic are "loanwords". For the last link please take a look especially ate the google books I have posted. Please take orthography and other mistakes into account since I wrote quickly. "There are what are called "sound shifts" for example Greek "bio" (life) Latin "vita" and Sanskrit "jiya" old irish "bethu" old english "cwic"[read quick] ARE ALL cognates that descend from the same constructed (but its more CORRECT to call it guessed) proto indo-european root *gwey which means "to live"
Note that those cognates of the descendant ie languages do not all mean "life" but semantically have various meanings from "AGE" to "world"
Then maybe "kam" was inherited from Tocharian languages (a centum IE branch). The English word "copper" directly descends from Latin "cuprum" which in turn evolved from Latin "aes Cyprium" (literally "metal of Cyprus"; I misspelled the word "Cyprium" above: there is an 'i' between 'r' and 'u'). "Copper", "cuprum" and "aes Cyprium" all have the same meaning: copper. But the name of the island of Cyprus may be descended from the Semitic word for copper. Its opposite may also be true: as in Latin, the Semitic word for copper may be descended from the name of the island of Cyprus, which may originally be an Eteocypriot word. There are many other possibilities too, but I don't want to go into too much detail. The Turkic word for copper "bakir" (it is actually not the only Turkic word for copper, "mis" [directly descended from the Persian word for copper "mis"] is today more prevalent in Turkic languages, but it is possible that "bakir" was the only word for copper in pre-Islamic Turkic languages and was partially replaced by "mis" during the Islamic era of Turkic languages) may ultimately be descended from an ancient form of the name of the island of Cyprus through a metathesis from "*kapir" or "*kupir", 'p' evolving into 'b' at the beginning of the word as is the usual rule in Turkic languages (though it is "pakir" in Kyrgyz language, but don't know whether it is a preservation of the original form or a later evolution from "bakir"). Sorry, Dieneke, I had to divide my comment into two because of its length. Ashraf, do you have full access to the Behar et al. 2010 paper? Thanks for the informations as for your question the answer is "no"
"Gamkrelidze and Ivanov also propose two etymologies that suggest some Sumerian metallurgy was introduced to PIH speakers. The first is PIH *r(e)ud[h] “red, copper, ore” from the Sumerian urudu. They claim convincingly that metal names often came from color terms. In this connection, it is interesting to note that in a bilingual vocabulary the Eblaite gloss on the Sumerian urudu was kapalu/kaparu. This is clearly derived from the West Semitic kpr, a root with many meanings. One is found in the Hebrew kop(p)er “henna” used for red dye. If kop(p)er “red” also meant “copper” Kypros/Cyprus seems to be a West Semitic name for the island famous for its copper, rather than the toponym originating the metal name found in the Latin cuprum"
Many things are possible, but I think we have gone off topic enough, so better end this discussion here, thanks for the information sharing. Ashraf, I asked you about Behar et al. because you seemed to me to know something that I didn't know about it based on something you wrote in anthrocivitas forum. You write there, "Component amongst Anatolian Turks (the tested ones were Turkmen and less Turk component should be expected for the bulk of Anatolian Turks)." Firstly, you wrote this only for the autosomal study samples of Turks (excluding the Y-chromosome and mtDNA samples of Turks), didn't you? It is obvious from the context that by Turkmen you mean Turkey Turkmens here. What I especially want to ask you is from where you learned that the tested Turks in Behar et al. were all Turkey Turkmens, as I found no information about the sub-ethnic identities and locations of the tested Turks in all the freely accessible material of the Behar et al. paper. --------------->I believe this pretty much settles it. Achaean, what you write is not about the origin of the name of Cyprus, but about the origin of the English word "copper", and this is something that is already settled. I was mistaken in fact (to be honest I guessed that the tested persons should have been Turkmen/yörük/tahatcı... since I thought that the Behar's ekip would pick up "pure" human groups to test them such as mozabites from north africa, yoruks from turkey, druzes from israel, bedouins from palestine etc...) and that's why I changed again the signature deleting that part of it. Then how did you understand that you were mistaken (as there is no information about the sub-ethnic identities or locations of the tested Turks in the freely accessible parts of the Behar et al. paper)? Though perhaps some percentage of that north mongoloid component is a legacy of mongols, cumans as well as huns (or at lest a part of the Hun warriors) or unattested pre historical tiny wanderers. Remains that most probably the ones that wandered to middle east throughout history were in fact mixed caucasoid-mongoloid wanderers as while central Asia and even Mongolia have an important western Asian Caucasoid component, the mongoloid component in western Asia is in traces. I think that the main cause why nostraticist linguists group indo-european together with altaic, japonic, korean, uralic, gilyak, and nivkh_despite the fact that caucasoids are very distant genetically from mongoloids, to such as extent that caucasoids are closer negroids than to mongoloids_is in fact due to very old lexical and grammatical borrowings from the western asian genetical and(to greater extent) cultural diffusion that resulted in proto macro-altaic speaking hunterers and gatherers being linguistically submerged by those wandering western asians and having their language higly influenced lexically and grammatically by western asian languages(albeit still altaic and uralic languages differ greatly in morphology from indo-european languages in being non apophonic, non inflective, gender lacking, article lacking, preposition lacking, non synthetic [no compound]languages with monosyllabic mono and biconosonantic[no triconsonantal and tetraconsonantal roots] agglutinative. (albeit still altaic and uralic languages differ greatly in morphology from indo-european languages in being non apophonic, non inflective, gender lacking, article lacking, preposition lacking, non synthetic [no compound]languages with monosyllabic mono and biconosonantic[roots and not triconsonantal and tetraconsonantal roots]agglutinative languages. Macro-Altaic language urheimat is very probably central eastern Siberia with C3 hg Y-DNA being Altaic marker. "Macro-Altaic language urheimat is very probably central eastern Siberia with C3 hg Y-DNA being Altaic marker." Ashraf, if they exclusively tested a specific sub-ethnic group of Turks, I think they would label them not as Turks but with the name of that sub-ethnic group, as they did for sub-ethnic groups like Bedouins and the Druze (though some regard the Druze as an ethnic group on its own). For the authors, the only criterion to be regarded as pure must be being exclusively descended from the tested ethnic group irrespective of sub-ethnic group in the genealogically traceable genealogic tree (not more than a few generations for the overwhelming majority of the members of most ethnic groups including Turks). Obviously, the two results cannot both be true. Further complicating the matter is the fact that Caucasian ethnicities like Adygeis (Circassians) and East Europeans like Russians too show either Dravidoid or Mongoloid as the main (and mostly the only) non-Caucasoid admixture cluster depending on the study. So there is some confusion here and I think only very detailed genetic sampling and investigation of the Central Eurasian area (in its broadest meaning) will settle the matter. Further complicating the matter is the fact that Caucasian ethnicities like Adygeis (Circassians) and East Europeans like Russians too show either Dravidoid or Mongoloid as the main (and mostly the only) non-Caucasoid admixture cluster depending on the study. Apparently the non-Caucasoid component in East European, northern West Asian and Caucasian populations is far from clear, for a particular population of these regions sometimes showing up as Dravidoid, sometimes as Mongoloid and less frequently as a mixture of both in worldwide studies involving both Dravidoids and Mongoloids. Certainly more studies are needed to clarify the issue. According to the distinguished linguist Greenber the closest language families to indo-european are Altaic ,Uralic, Gilyak, Japonic, Korean, Nivkh (he has a book with this name and called this family Euro-Asiatic) this is mostly based on the fact that personal pronouns of some of the languages belonging to these families have similar personal pronouns with indo-european while their grammar are very different and the amount of their shared lexic roots is not as big as Afro-Asiatic and Kartvelian (toward indo-european). 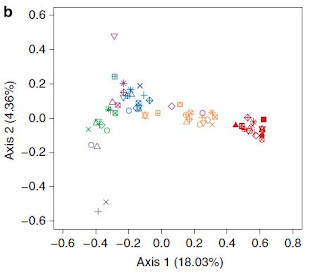 But grammar as well prepositions of Afro-Asiatic is very similar with the indo-european one and Dolgopolsky contests Greenberg works showing that those personal pronouns are also present in Afro-Asiatic and even they have more matches with ie eurasiatic and nostratic than uralic and altaic. Another common feature of Altaic (I am assuming that such a language family exists) and Uralic languages that you should mention is vowel harmony. I think primitivity of Uralic and Altaic languages is something that should be expected as they were exclusively spoken by hunter-gatherers until relatively recent times. That is why they heavily borrowed words from Indo-European and Semitic languages as they spread among settled and pastoral populations mostly speaking Indo-European languages. The "problem" with Turkic (and generally speaking with many of the agglutinative languages of Siberia such as Altaic, Uralic, Aleut, Japonic) is that many listed "pure" Turkic words do lack a Turkic etymology. For example there is an attested Turkic (and also Altaic) root "at"=to throw, and we have also "at"=horse, both "at" are listed as "pure" Turkic words though the conncetion of "at"=horse with "at"=to throw is ambiguous and unexplainable and there are hundreds of such words (note that "at" could be connected with sahred semito-egyptian and indo-iranian isogloss "asw"=horse which is the satem form of "ekw(os)"=horse) for example "bal" (honey) when we have proto Turkic "bal" meaning to tie (bal could be conncted with afro-asiatic "milt"=honey with b<=>m sound change. "we" (we) "mi" (me) "ti/si" (you) have cognates in both ie,aa,uralic,altaic... and those words could be onomatopoeic or we can perhaps connect "mi" with "man"=who, sperm in Afro-Asiatic and man in Indo-European?? "The Eurasiatic hypothesis...One of the basic difficulties to proving a genetic relationship between two languages is that contact between populations often results in exchange of words, so that similarities in vocabulary do not necessarily indicate a common origin." Long etymological discussions are off-topic. You have also both quadruple-posted, which is against the blog rules. I am more than sorry.